Item2017-04-05-06 - Hydro Sub. John E./Nelson St. 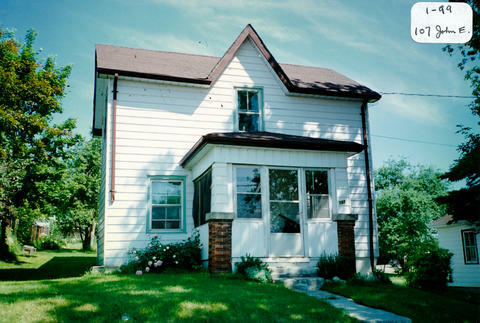 The mid-block building on the north side at 107 John St. East was built around the 1880’s in the Gothic Revival Cottage style. The main house was moved to this site from the saw mill in Amsterdam during the early 1900’s. It was the home of Arthur “Mike” Saint and his wife Alice and children (Russell, Eric, Ralph, Zella, Rita and Archie). He had immigrated to Bradford from London, England in 1871 with his parents (William and Sarah) and siblings (Thomas, Harry, Frank, George, Annie and Maria). William died in 1875. All of his sons were in the building trade. Mike was a well-known brick layer and he also raised and showed chickens. There once was a 1½-storey frame barn at the back of the house that was used to store feed, a horse, and a cow. A chicken house was attached to the barn. A huge, old well was found (beyond the back fence) that was thought to belong to the first hotel (located on the only street) when Bradford was first founded.